JAMMU, MARCH 27: Equipped with rockets and 12.7-mm machine guns, Mi-17 helicopters will now hover over mountainous peaks in search of terrorists and their hideouts, as Army authorities decide to seek the help of the Indian Air Force in counter-insurgency operations in Kashmir this summer. In fact, sources said these IAF gunships were used last Friday for the first time during the decade-long insurgency in the state above the snow-clad mountains in the Marwah area of Doda district. Three top foreign terrorists were killed in a closely coordinated operation between the Army and Air Force, which added a new dimension to the counter- insurgency operations in the district, a Defence spokesman said. Giving details, sources said that troops of the 11 Rashtriya Rifles along with a party of the State Police, acting on a tip-off, launched a massive "seek-and-destroy operation'' in the treacherous ridges of Marwah. While combing parties engaged terrorists in the exchange of fire, commandos of the 31 Rashtriya Rifles were soon despatched to the area in gunships. 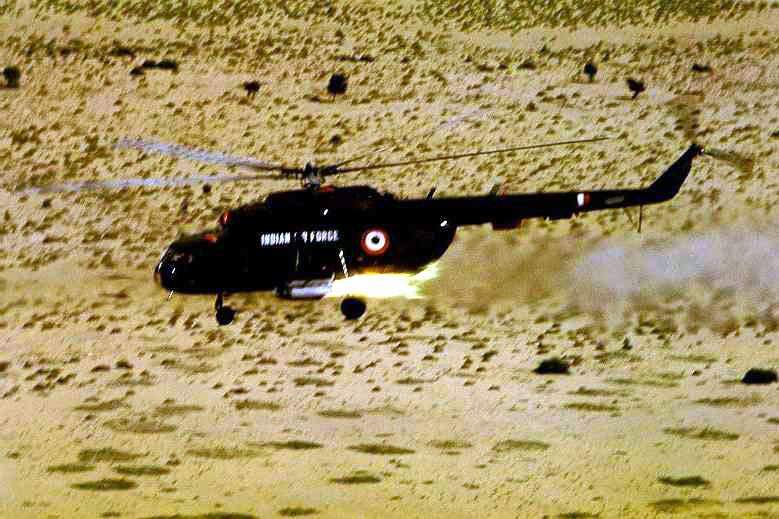 During the operation, the troops used "tremendous fire power by accurate and extensive dispensation of rockets from helicopters. The 12.7 mm machine guns were also used to spray the target thus gainfully facilitating sanitisation of the entire area,'' the spokesman said. Admitting the use of IAF gunships during an operation in Marwah, Major General General Staff (MGGS) PS Bindra at the Northern Command here, said that these would be used only at places where there are "targets'' for the IAF. Pointing out that Air Force has limited targets during counter insurgency operations, he said that "we cannot use helicopters in militancy infested areas inhabited by civilian population.'' These can be only used where targets are clearly identified and there are no chances of any collateral damage to civilian population, Bindra added. 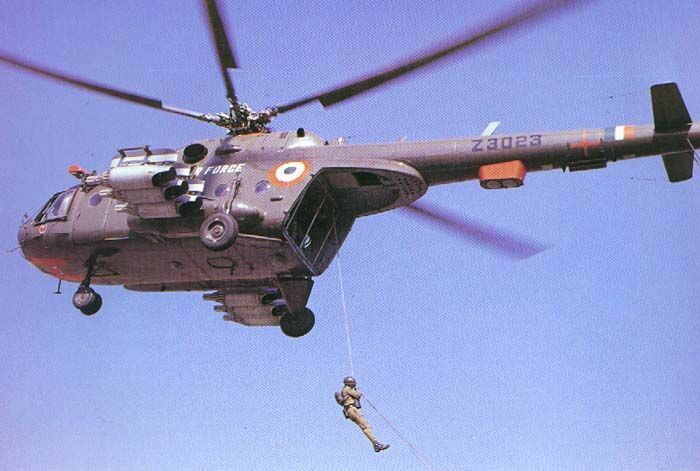 Describing the use of Mi-17 helicopters as a significant development, sources said that it has been for the first time that these have been requisitioned by the troops to target terrorists and their hideouts in mountainous terrains. Encouraged by the success of Friday's Marwah mission, troops will be requisitioning these IAF gunships as and when required, they added. The use of Mi-17s will change the ground situation even on the higher reaches where terrorists often take refuge after attacking security forces or killing innocent civilians, senior army officers said. Now, the troops' response to terrorists will be quicker as these gunships will speed up movement of troops in the hilly terrain, they said. The State has numerous mountainous ridges including Pir Panjal, Seouj Dhar and Himalayas. While the Pir Panjal range starts from Pakistan Occupied Kashmir (PoK) and separates Jammu region from Kashmir Valley, the Seouj Dhar is a dividing line between Udhampur and Doda districts. The Himalayan range comes to Doda from Kashmir Valley. Earlier, the terrorists hiding in these mountains used to melt away after noticing troops approaching them from a distance. However, the use of IAF gunships will not only eliminate their chances of escape, but also lessen the possibility of casualties among security forces during an operation, sources added. 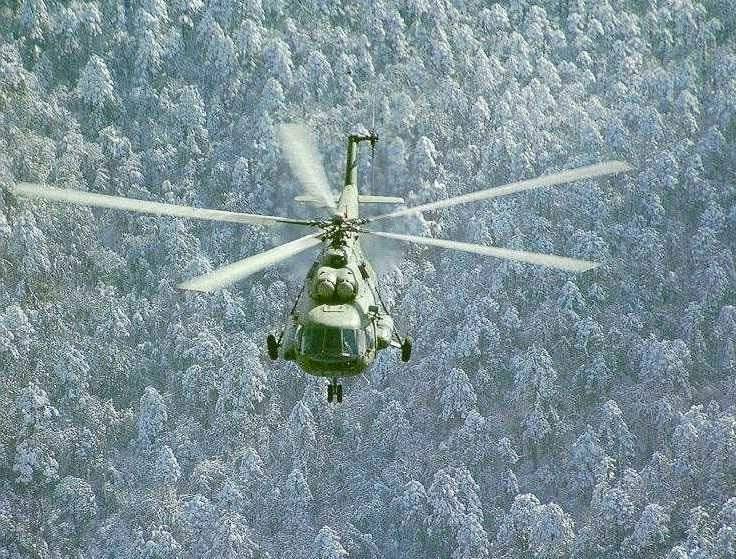 A Mi-17 flies over a dense forest Himalayan region. 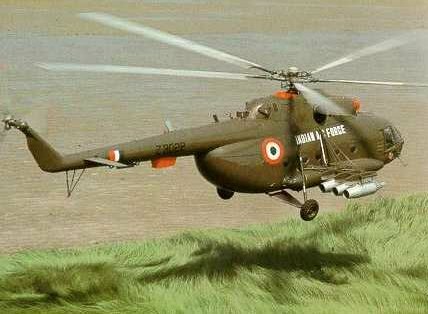 An IAF Mi-17 can be visually distinguished from a Mi-8 by the position of the tail rotor; which in the former is on the port side and on the starboard side for the latter. 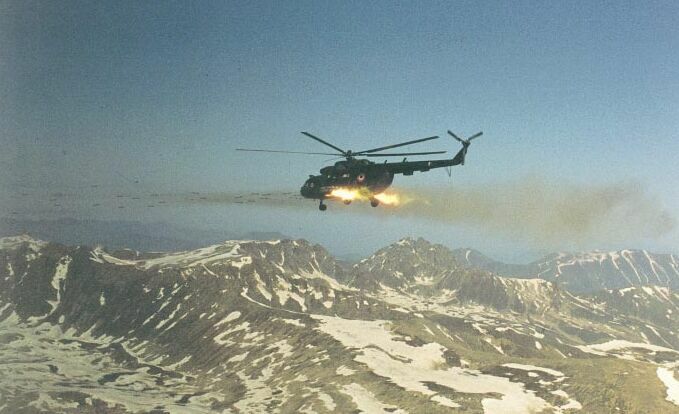 A Mi-17 fires rockets on Pakistani positions in the summer of 1999 during Op Safedsagar. 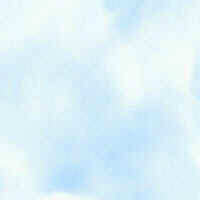 The operations over Kargil were at a much higher altitude compared to the rest of Jammu and Kashmir. bharat-rakshak.com/MONITOR/ISSUE3-2/lns.html: An informative overview of the CI Operations in Jammu & Kashmir; history and tactics.